I'm so excited, my room feels a little more complete now! Last weekend, 2 flat packed boxes arrived, waking me from my slumber. As usual weekend is the only time I get to catch up with sleep.. First box arrived around 9am. 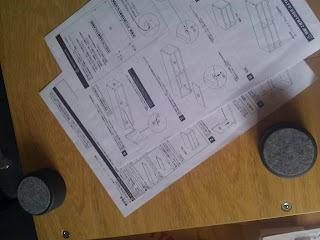 After signing off the box, I trudged back to bed, only to be woken up again a couple of hours later by the second box. 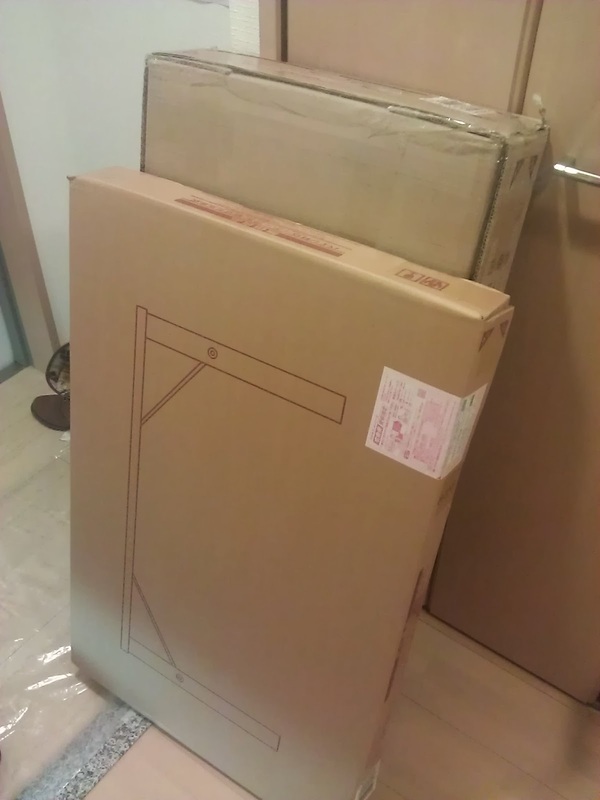 Since my room is so tiny, I had to leave the boxes at the entrance. 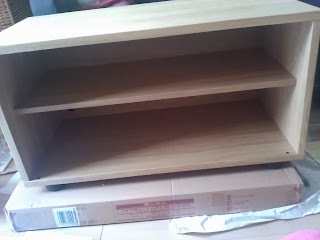 Both were from Muji. All of my earlier furniture were from Ikea; but for a Japanese-size studio, it was really difficult to find what fitted the available space. I really love the natural wood theme so the wait was worth it. Long story short, I had to go back and forth between Ikea and Muji trying hard to match the current theme and budget. Deciding that I was tired of eating on a box for over a year now (can't believe I've been doing that for so long!) I got myself out of bed to build this. Sure, building a TV rack is not rocket science. 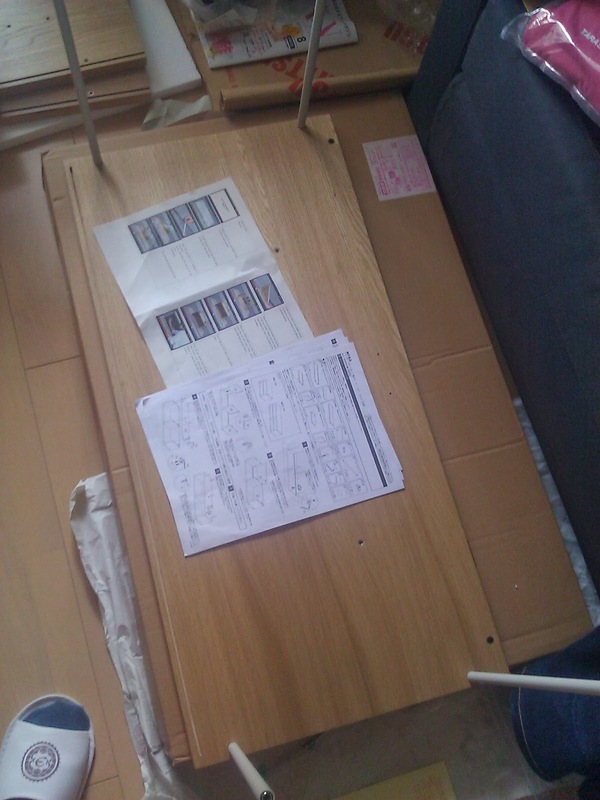 But the instructions came in Japanese and this was oak wood. Great workout first thing in the morning. 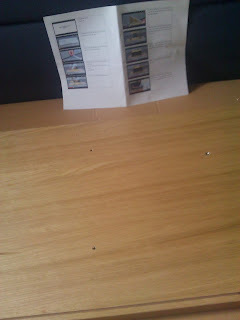 Trying not to scratch the wooden floor, I placed cardboard pieces all over and started to make sure the pieces matched what was on the instruction sheet. Quite a challenge considering I was too lazy to translate so early in the morning. Starting with the top panel, I had to screw in these steel rods in 4 corners. 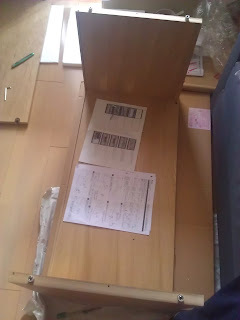 Not difficult, but the instructions my colleague translated did not match parts of what was given in the instructions sheet. I got a little confused and started second-guessing my instincts. 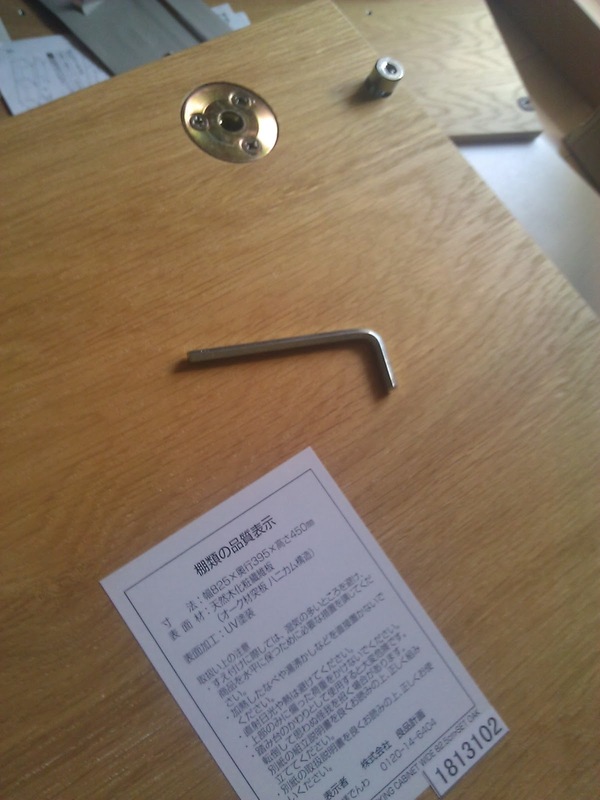 Sliding the side panels through the steel rods was quite fun. So this is how they put wood panels together without nails! Somehow the holes in the panel were not entirely a straight cylinder, so this required some adjusting. Then the thinner back panel. Trying to match the groove for all the sides took a little bit of time. I had to do this a few times. Took out the side panels and then re-screwed the steel rods a few times. By the time I reached the bottom panel, I had "kepit" my fingers a few times because it was not as light as I had imagined. This took even more tries trying to make sure all the corners matched. 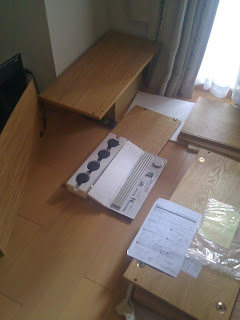 Again I had to remove the back panel, the side panels and the steel rods multiple times. I was getting a hang of doing this. 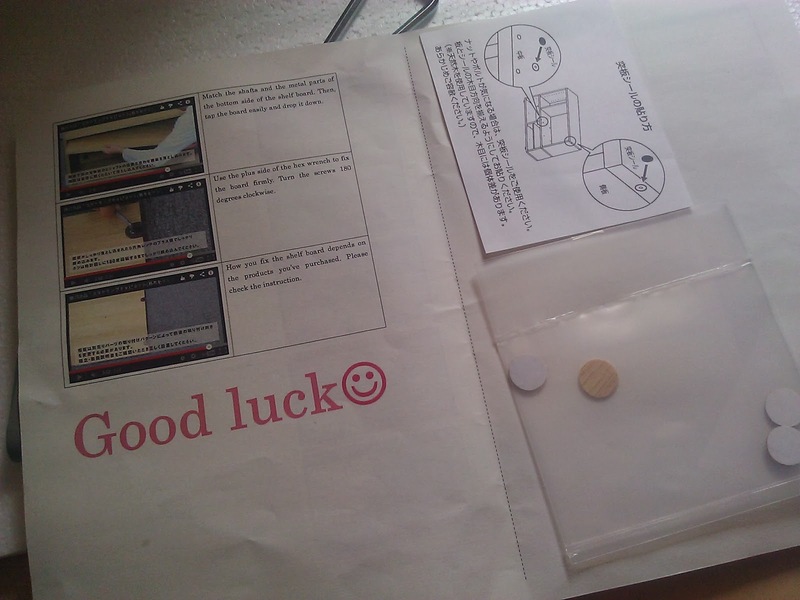 The instruction video lasted only a few minutes. There I was redoing things so many times I took almost an hour. 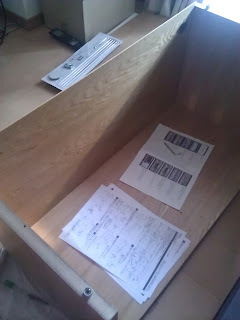 When I was confident all the sides had matched, I started to put in the final bolts. Then the steel caps for the legs. How considerate of them to provide felt pads to protect the flooring. 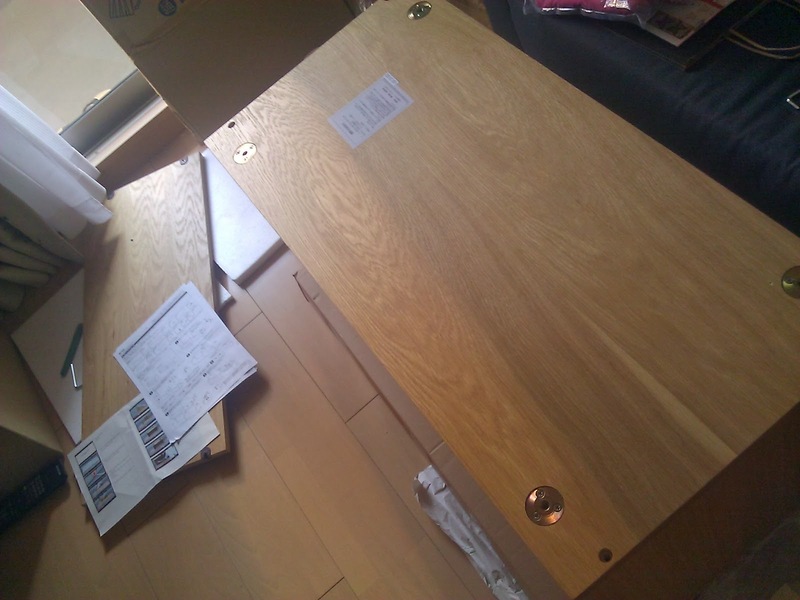 There were some additional round stickers in the pattern of natural wood, to cover the bolts from showing. This was the instruction sheet that my colleague translated. Yuri was the one who helped me move in when I first came to Kobe. She was so gungho when I got my bed that she said both of us could build it ourselves! 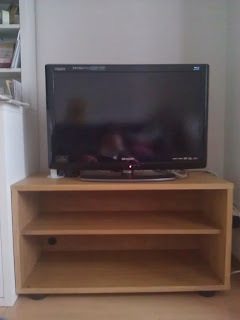 Ah, finally my TV rack. The pieces were a little heavy alright, but I really liked the solid feel of it. After unplugging all the wires and cables for the TV, modem and router, and cleaning the little corner, and finally arranging everything back again I now finally have my TV rack! Such awesomeness - I love the natural colours (nevermind that it did not match my Ikea white colours) and the fact that I built this myself!